*Plott Balsams named for Henry and descendants—mile marker 457.9 on Blue Ridge Parkway near Waynesville, NC. 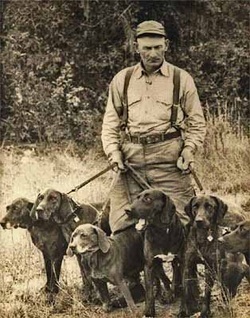 Henry’s sons John and Amos were best known for the hounds—John for breeding them; Amos for hunting them. Henry left his dogs to his oldest son John who continued the breeding program and in turn left his dogs to his son Montraville. * Mont supposedly permitted first outcross to a leopard dog. John Plott, Mont's oldest son, preferred a hot nose dog--one that could find a scent quickly.